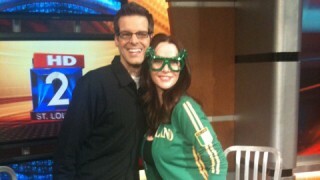 Annie Wersching appeared on FOX 2 News St Louis at 9:15 AM with Tim Ezell today. She talks a bit about 24, the fan campaign to get her on The Ellen DeGeneres Show, and more. Tim Ezell: Welcome back to FOX 2 News at 9AM. She was raised right here in our own backyard, but she made it big time with CTU. It’s Annie Wersching, she plays Renee Walker, FBI Agent on the show 24. Thanks for joining us this morning. Annie Wersching: Thanks for having me! Tim Ezell: Alright, first, let’s talk about this show. Unbelievable, there’s always something coming down the pike that you never expect. Tim Ezell: How soon do you know what’s going to happen to your character Renee Walker before you start? Tim Ezell: They don’t give you much notice? Tim Ezell: How cool is it to be on a show like this cause in a day when reality TV is non-stop, to be on a show where you actually have good writers who come up with a great storyline, what is that like as an actress to be a part of that? Annie Wersching: Oh my god, it’s amazing. And I was a huge fan of the show before I was even on it, so it’s unbelievable. Tim Ezell: Are you amazed with what they come up with? Annie Wersching: Yeah, I don’t actually envy the writers. I would not want to have to come up with a new crisis year after year. Tim Ezell: No joke! Cause you finish one and you’re like “That was really good!” but you can’t rest because it’s like “What are we doing next week”? Annie Wersching: Yeah, it’s tough. But they do a pretty good job! Tim Ezell: Now getting back home here in St. Louis area, that’s big for you, gotta love that. And this time of year it’s special for you with St. Patrick’s Day. Annie Wersching: Very special, I come home for every St. Patrick’s Day no matter what. I danced here when I was younger. I come back and kick up my heels with the girls I used to dance with. Tim Ezell: I’ve done a little Irish dancing in my day. Tim Ezell: Have you heard? Annie Wersching: I’ve heard sometimes you wear a dress. Tim Ezell: Sometimes. And the curls. I rock the curls a little bit! Cause I figured if you do the dance, you gotta rock the curls. Annie Wersching: I know, I was hoping for a little of that. Annie Wersching: Wow! First place. Tim Ezell: See I keep the feet, no the arms, still. You like that, that’s big right? Annie Wersching: Yeah, you could use that as a weapon on 24! Tim Ezell: Hey now, big news coming up for you personally. You’re expecting your first child, congratulations! Annie Wersching: I am! Thank you. Tim Ezell: Now here’s how I found out about it. As soon as people found out you were gonna be on the show, I got flooded with emails about people trying to get you on Ellen. You’ve heard about this? Annie Wersching: *Laughs* I’ve heard about this, yes! Tim Ezell: Tell me about this. Annie Wersching: Uh, they just started it. Some fans that follow me on Twitter and Facebook and stuff, they started an “Annie on Ellen” campaign. And they’re so sweet. For a while there was only like 26 people on the Facebook group, so we’re trying to get more. Tim Ezell: It’s huge now Annie! Annie Wersching: It’s huge, yes. Tim Ezell: There’s more than three hundred people and they want you on Ellen cause Ellen [Degeneres] gives away baby clothes. Annie Wersching: And she likes dancing. Tim Ezell: She likes dancing! Annie Wersching: and other stuff..
Tim Ezell: It’s a perfect fit! Annie Wersching: And I love Idol. There’s all kinds of connections. Tim Ezell: *Reaches into pockets* I don’t know if I still have Ellen on speed dial. Annie Wersching: You should send her a tweet or something. Tim Ezell: Yeah, I mean I talked to her last week… With the Idol schedule it’s hard to get up with her but..
Annie Wersching: Yeah, yeah, she’s busy. Tim Ezell: I’m gonna text her and let her know that.. Ellen, I’ll be calling ya! She watches the show, streams it online. I’ll be calling you Ellen to make sure you get Annie on the Ellen. That would be awesome. Annie Wersching here in town celebrating St. Patty’s Day. And don’t miss her on 24, because I’m telling you what – this show, something big in the works every single week. Annie, thank you so much for joining us. Annie Wersching: Thank you, thank you. Tim Ezell: We got barbecue outside if you’d like. Tim Ezell: Yeah, I think that’s good for the baby.